Heyhey, I'm working on a new Goff Orks project, and these here are the test figures for the colour scheme and general approach. 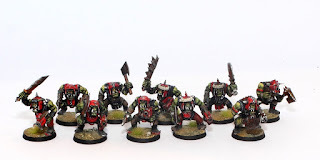 Haven't painted any Orks for a while now (in fact I hadn't painted any 40k models since early summer! ), and it's always great getting back to paint some GW minis. They're just fun to paint. Sure, most of the time cluttered with unnecessary stuff, but overall always fun to work with. The order was "Goff, black and red, checkerboard patterns, weathered and rusty". So I went, did those test minis, they got green-lit (ha!) by the customer, and now I'm off to paint the next 53 of the boyz the same way.